Showing 1 - 1 of 1 Products for Steering Tie Rod End Boot. Ties rods and ball joints are important components in the overall suspension equation, yet they are supplied with inferior rubber boots that deteriorate and tear over time. Replacing them with Daystar Dust Boots will increase the durability and longevity of these important suspension components. 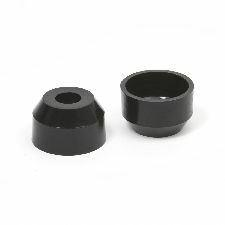 Unless otherwise stated, they are offered in universal applications so have the stud and overall joint diameters on hand.